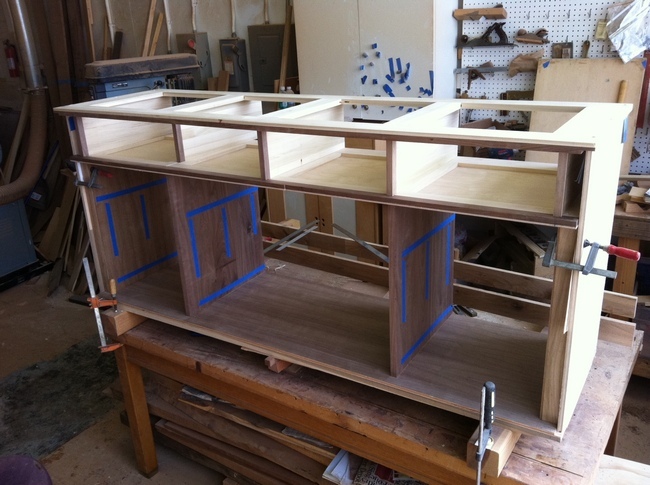 Internal frame including interior shelf space and drawers. 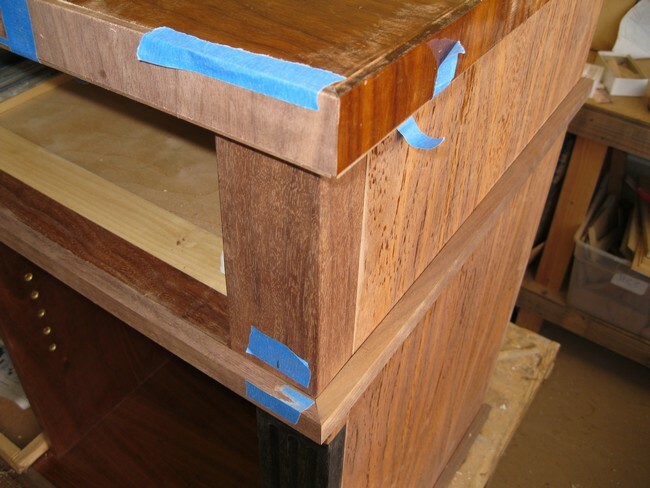 Blue tape defines locations of holes for shelf pins. 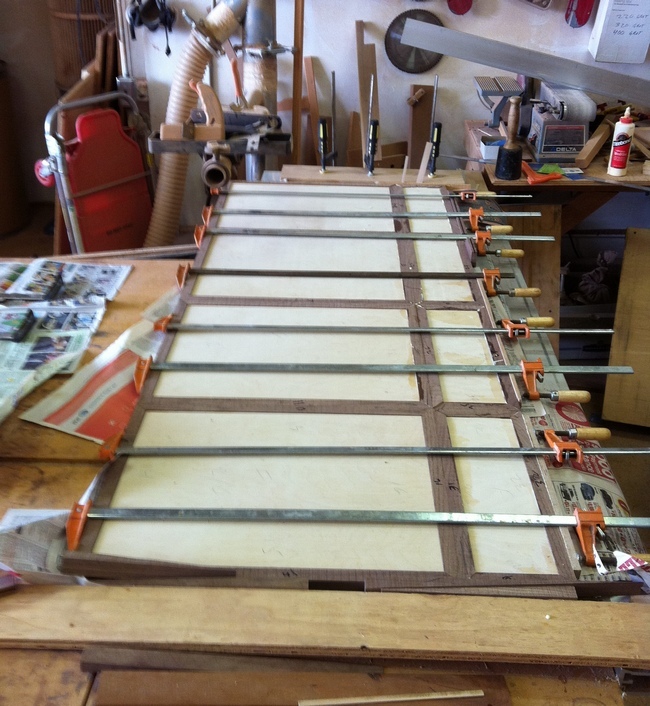 Next step is creating the doors, top and sides. 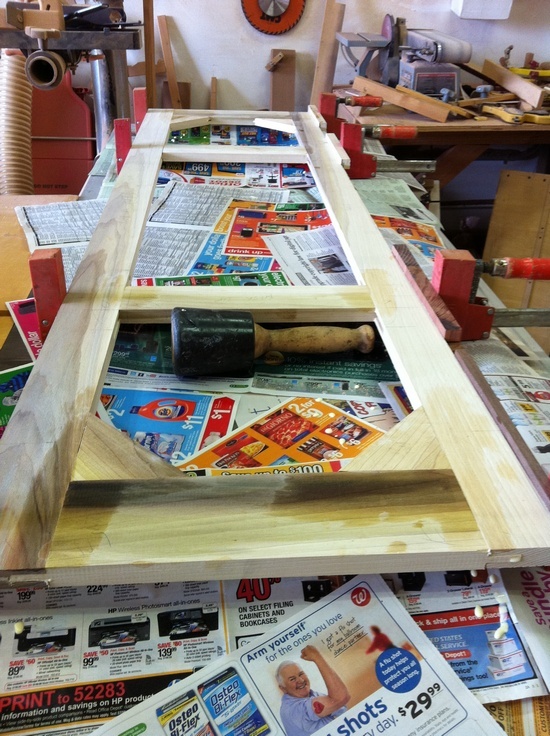 Glueup of door base plate. 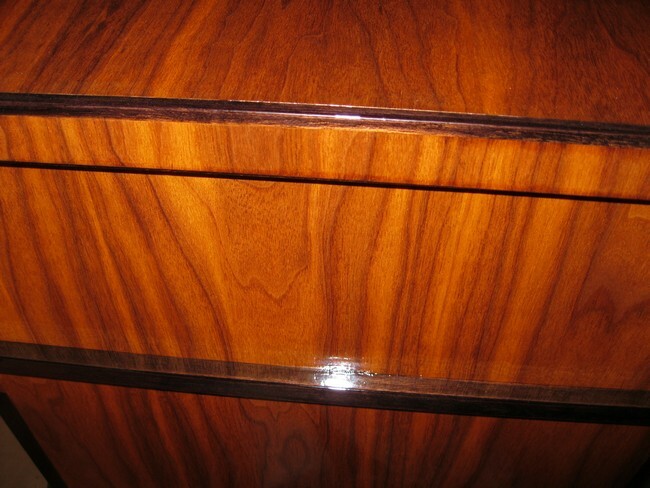 Doors and drawers are defined by walnut inset strips. 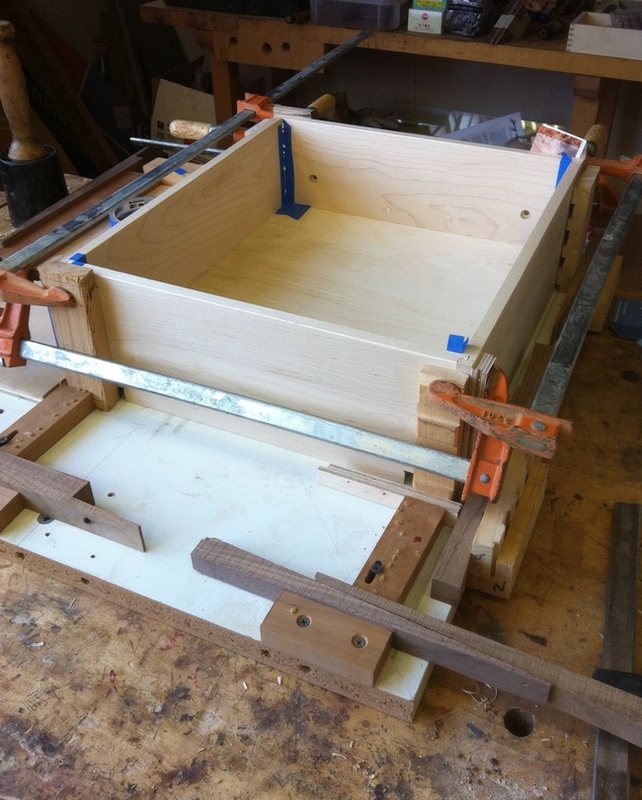 Door base plate roughly in place. 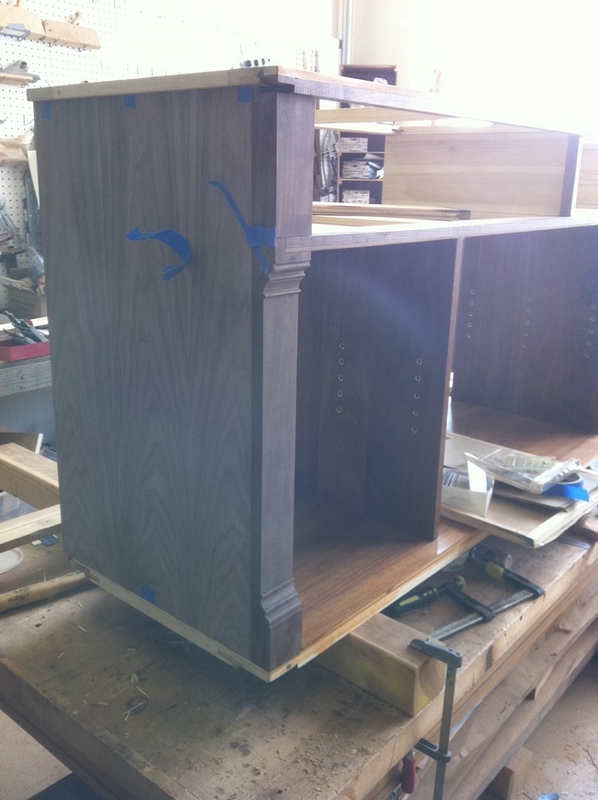 Veneer will be glued to front and back and individual doors/drawers cut out. 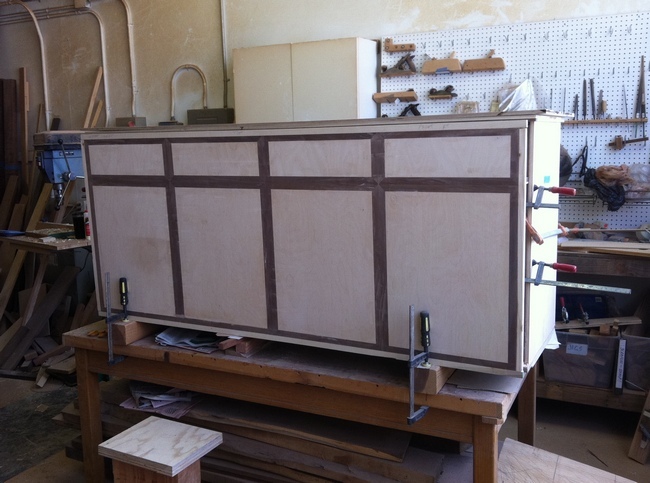 That will ensure continuity of grain from drawer down thru its corresponding door. 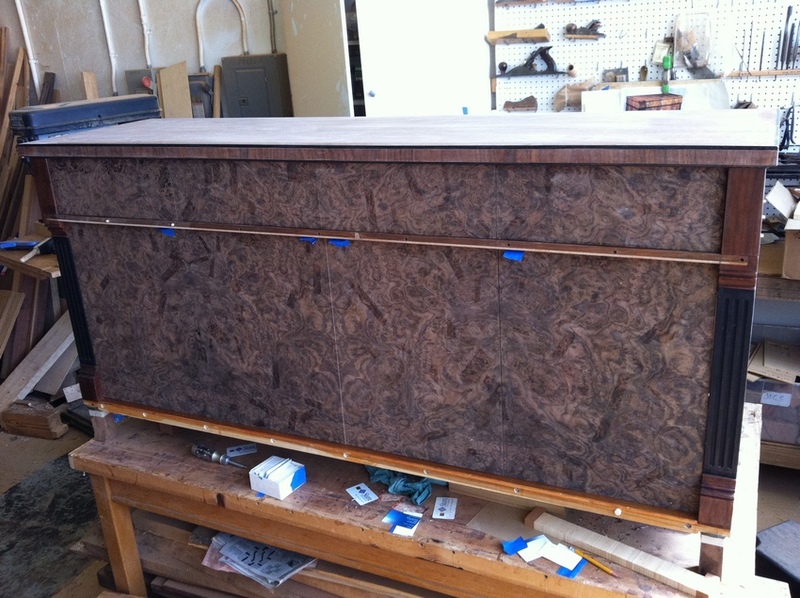 Veneering side panels. 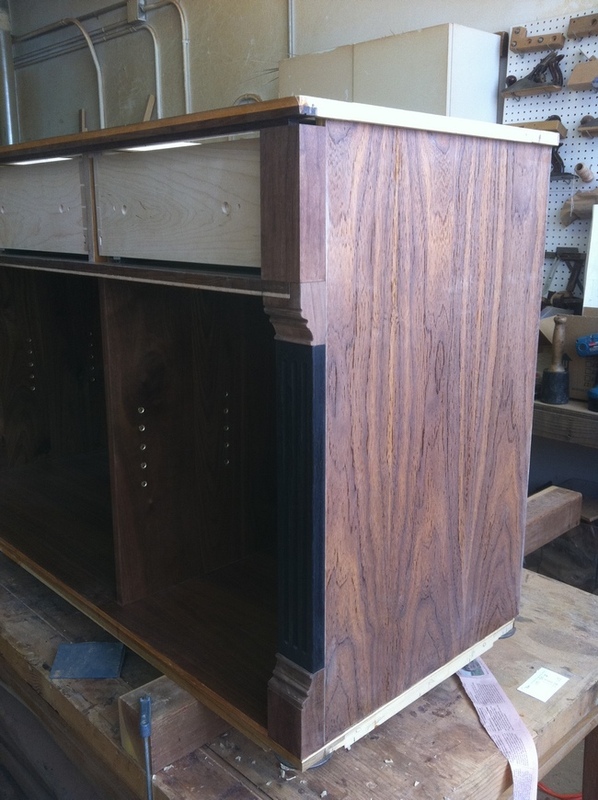 Grain pattern will flow up and over top of sideboard. 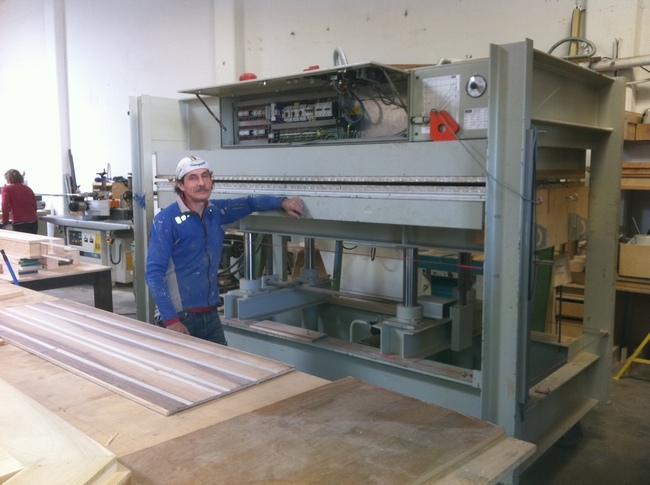 This very large veneer press is used in another shop in town to make large commercial interiors. 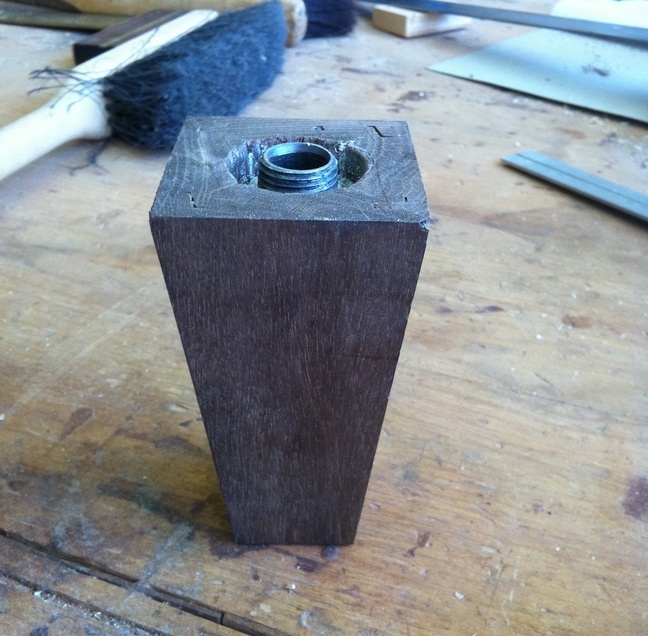 Step 9 Reassemble and glue carcass. 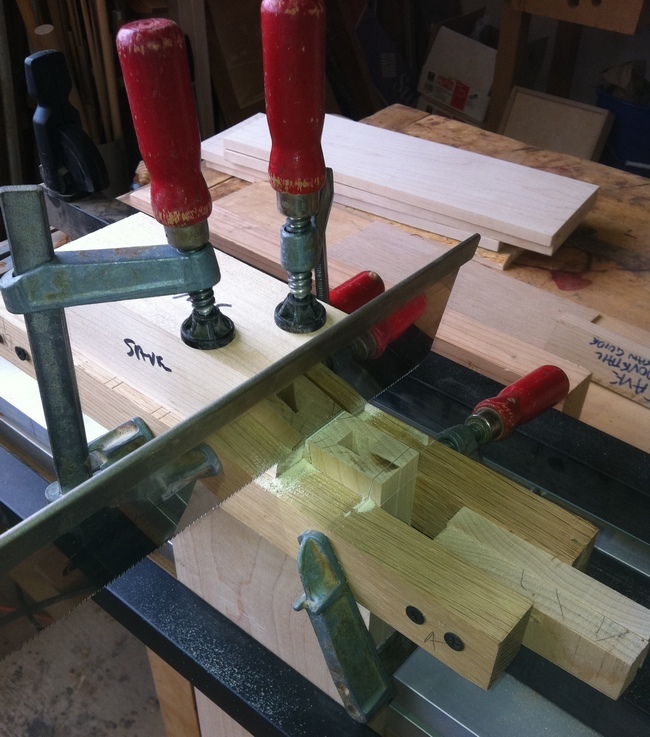 Build test drawer to test the fancy drawer slides. Install all drawer slides. Carcass is solid. 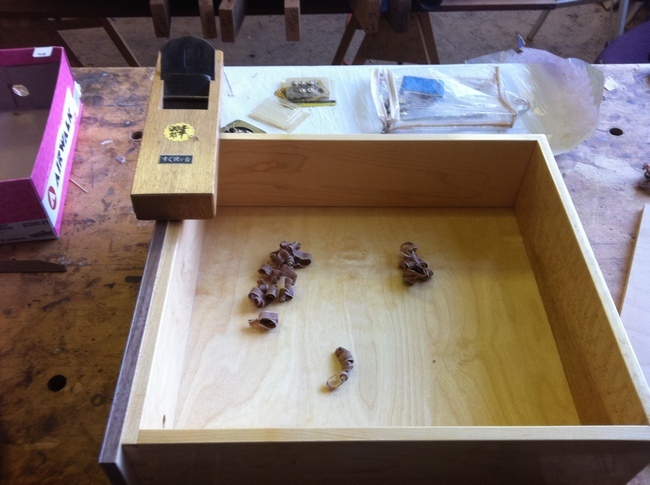 A test drawer is assembled with new drawer slides. 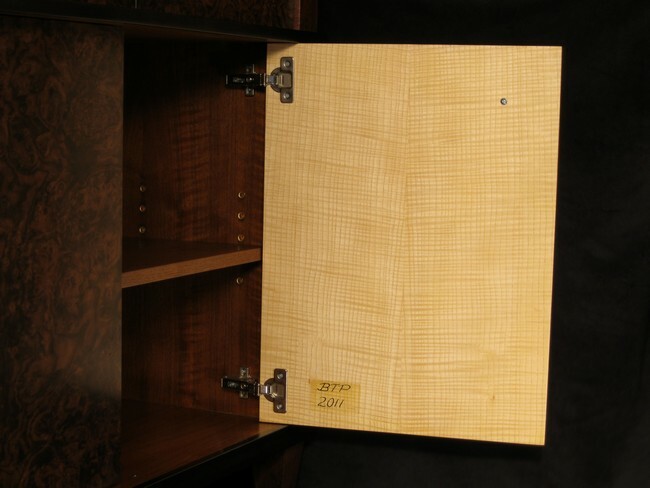 The drawer action is silent, smooth and very sleek! 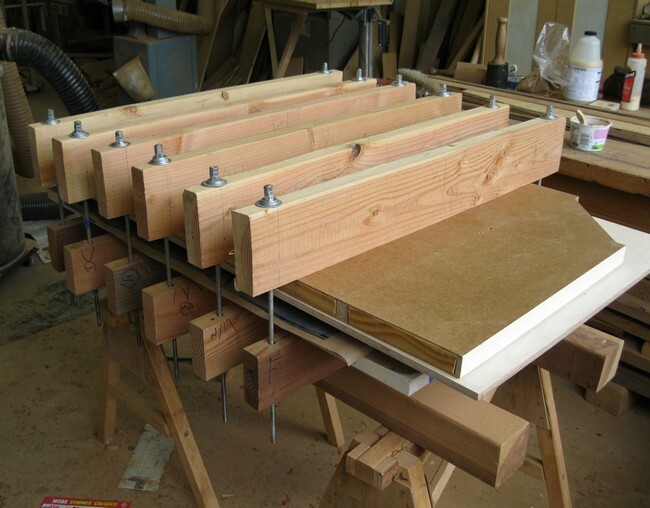 After cutting and fitting the pins, each drawer is glued together in a jig that ensures a squared drawer. 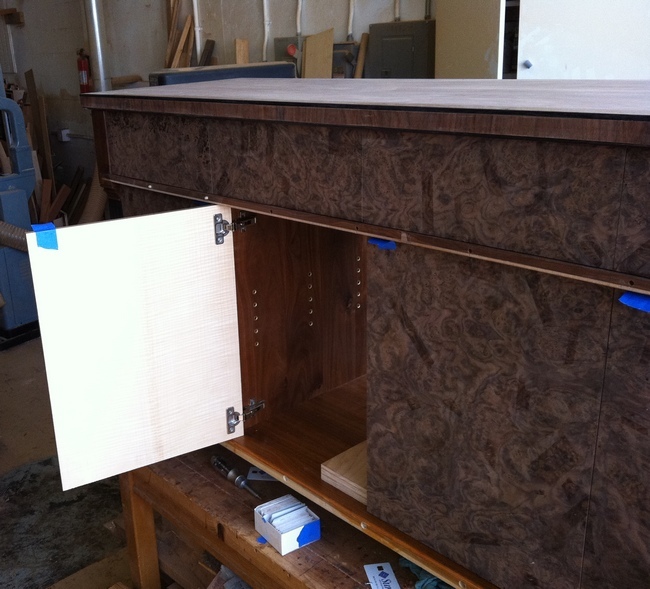 Upper left corner - the drawers(less the applied front with walnut burl) are complete and installed on the underguides. 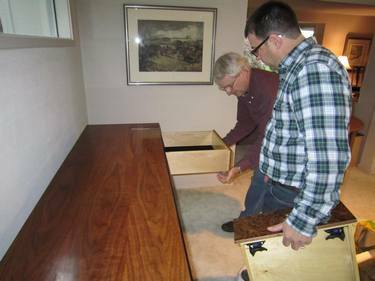 While my first impulse was to make the doors all at once - hence the base sheet of step 4 above, it became apparent that the walnut burl was too fragile to fasten into such a large sheet and then handle. 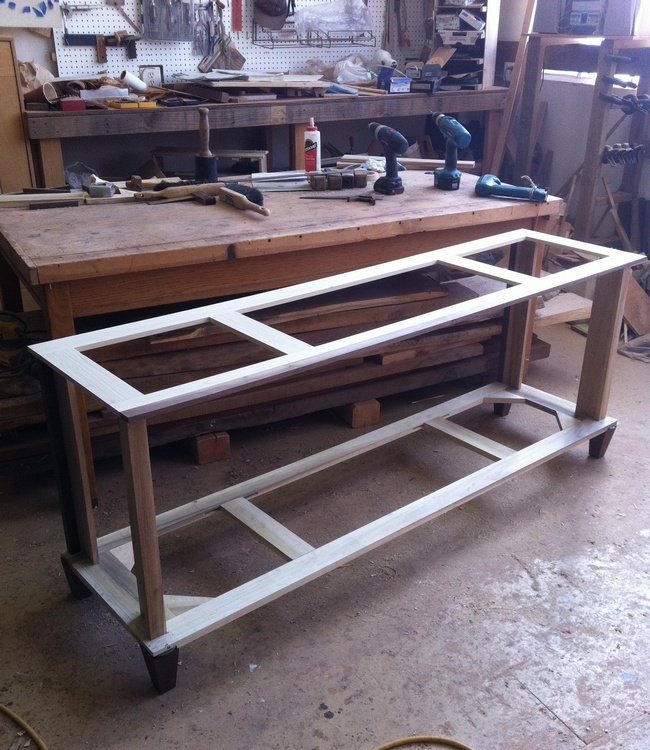 So I have cut the door/drawer bases apart and will veneer each individually. 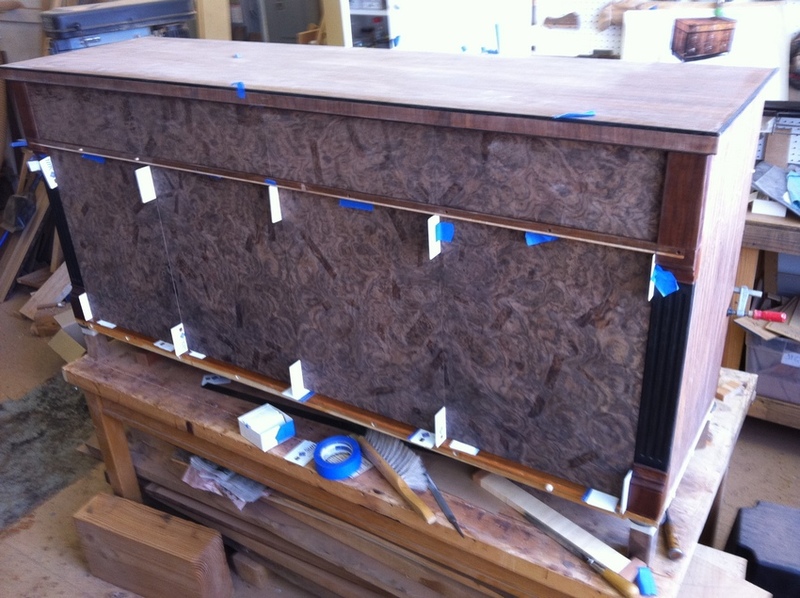 Each door/drawer sheet will be veneered twice - first with a cross-banding layer, then the final show layers - burl outside and quartersawn ash inside - for a total of 8 veneer pressings. 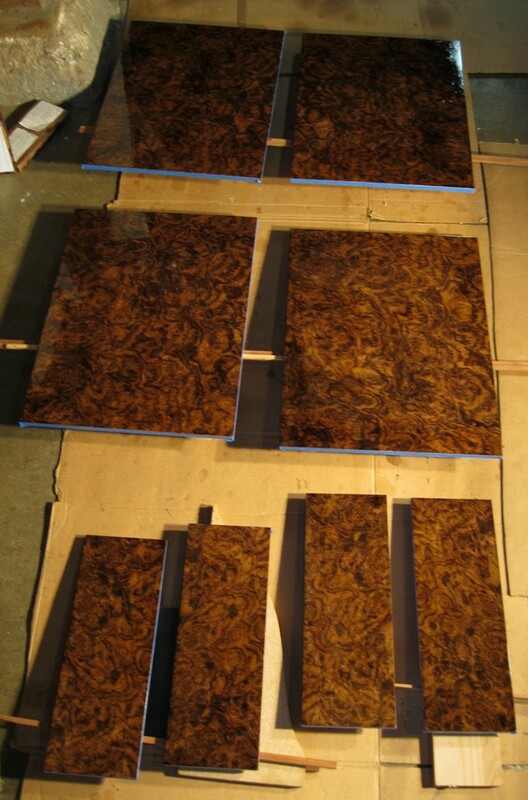 For the burl, I chose a match and have cut the sheets to rough size (about 1 inch larger all around than final size). Below shows the pattern. Sorry about the color - somehow my IPhone skewed toward too much blue in the picture. solution of water, alcohol and glycerin, then completely dried while being pressed. 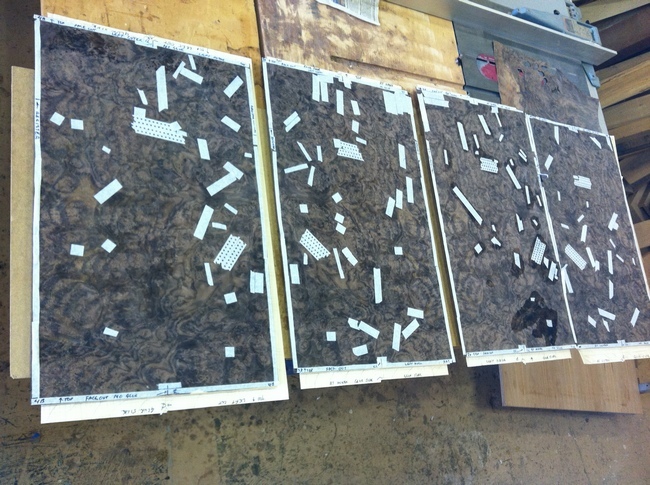 This process will probably take a week for all 4 sheets. The color is way off due to my iPhone. 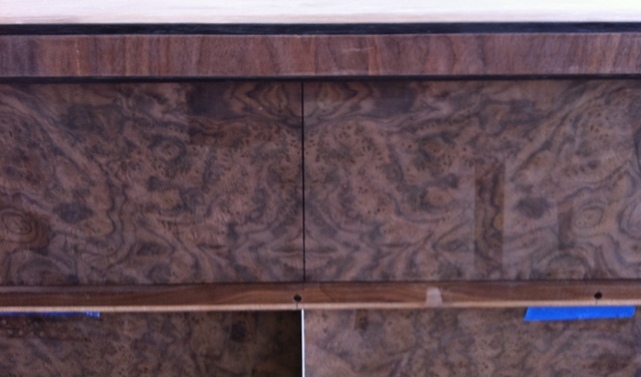 Drawer/door veneered pieces straight out of veneer press- white is veneer tape covering thin spots. 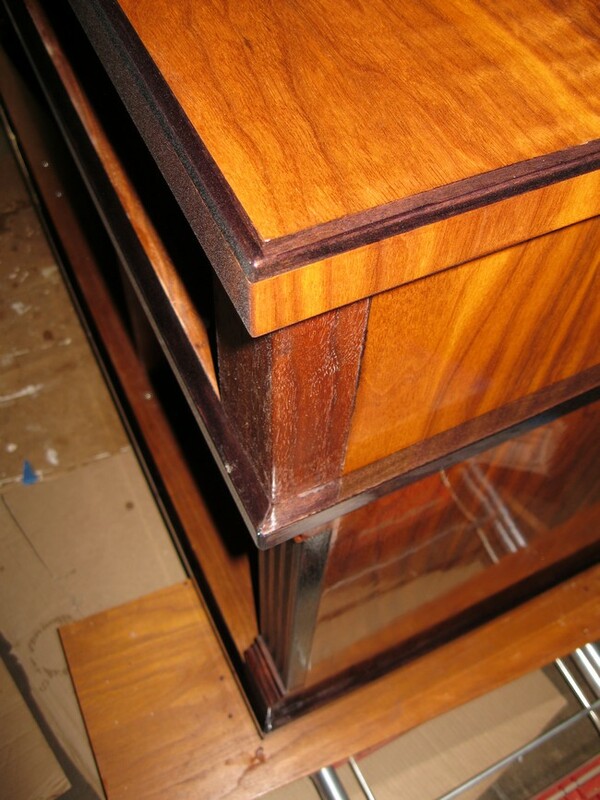 Veneer tape is all cleaned off with water and chisel. 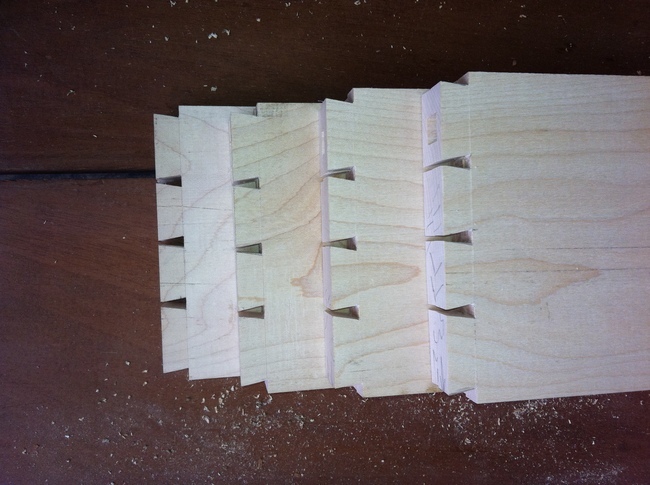 After cutting to shape and finishing, this is a picture of the door edge to show the resulting plies. 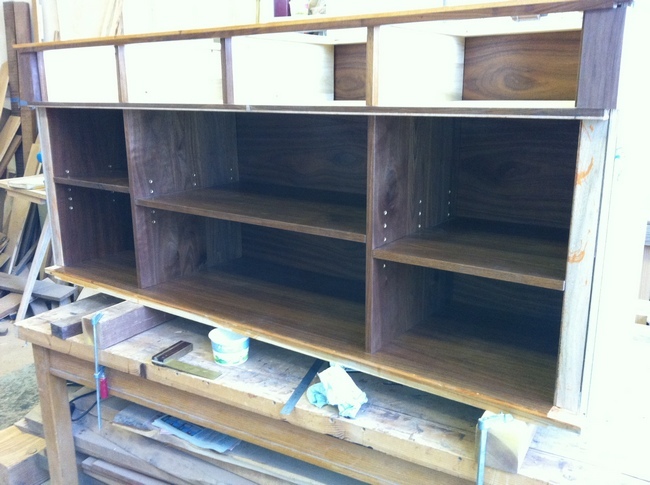 Doors and drawers are carefully cut and fitted to spaces - important to get all gaps even. 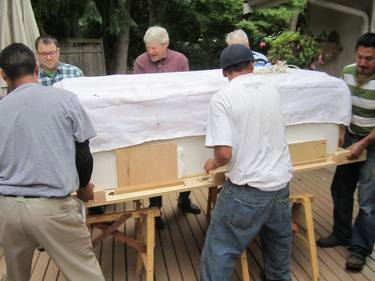 Final fitting is with Japanese plane that shaves wood thinner than a hair. 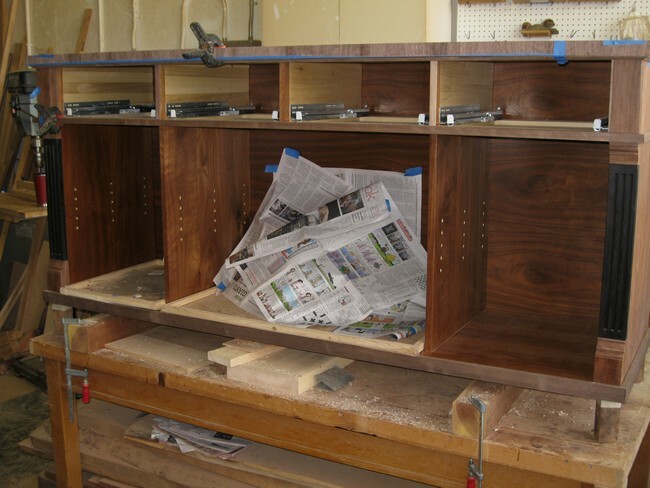 Mount drawer fronts on drawers using dowels. 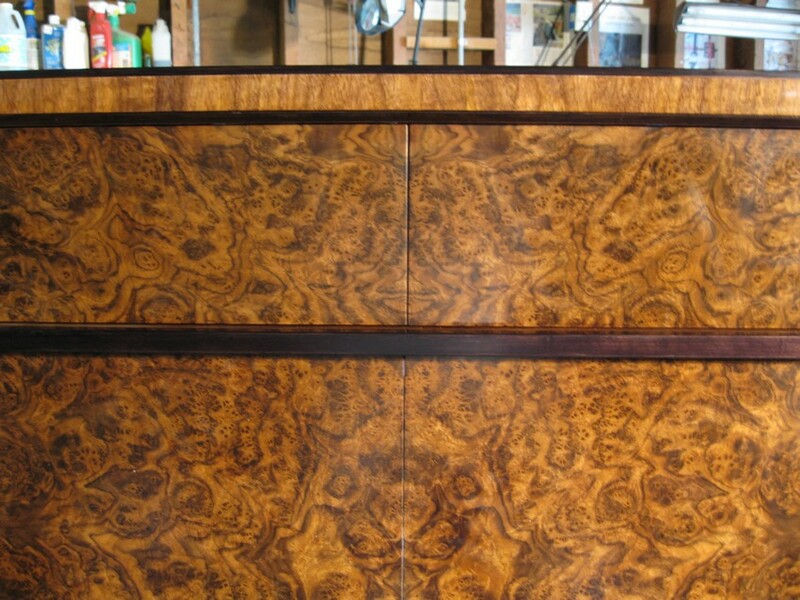 Detail of drawer center burl bookmatch. 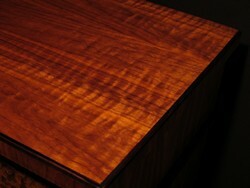 Note that this is raw wood with no cleanup or finish - may appear dull but will be stunning in end. 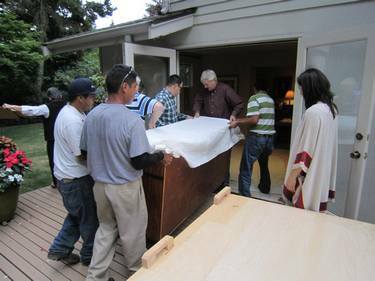 Doors are carefully hung on European-style hinges. Tolerances for placement are less than 1/16". The last remnants of blue tape are temporary pulls. 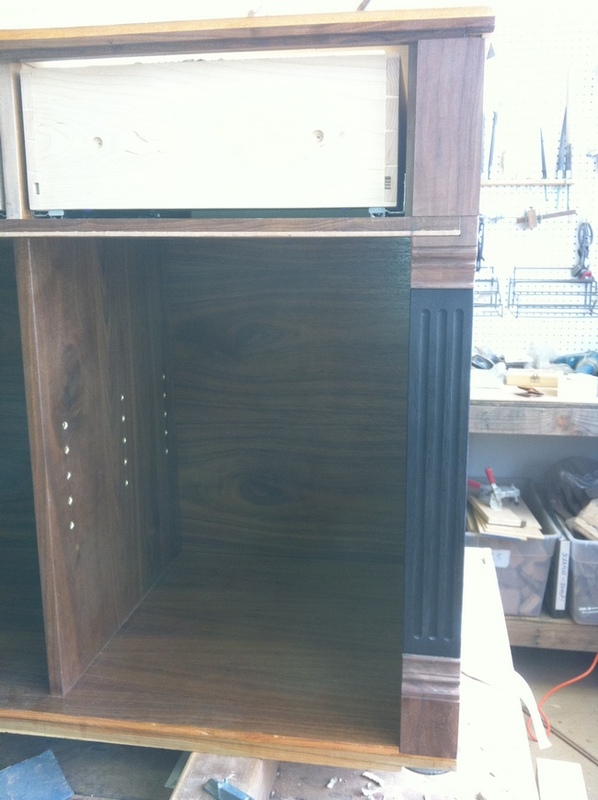 With one door open, now you can see the contrast of the inside quarter-sawn ash facing. 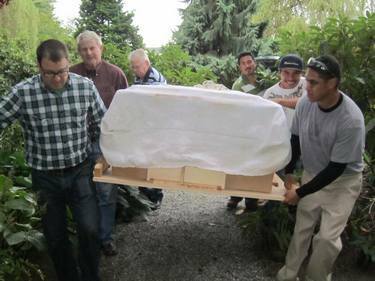 for two weeks, the pieces will be rubbbed with pumice and then rottenstone to achieve a clear, handrubbed finish. 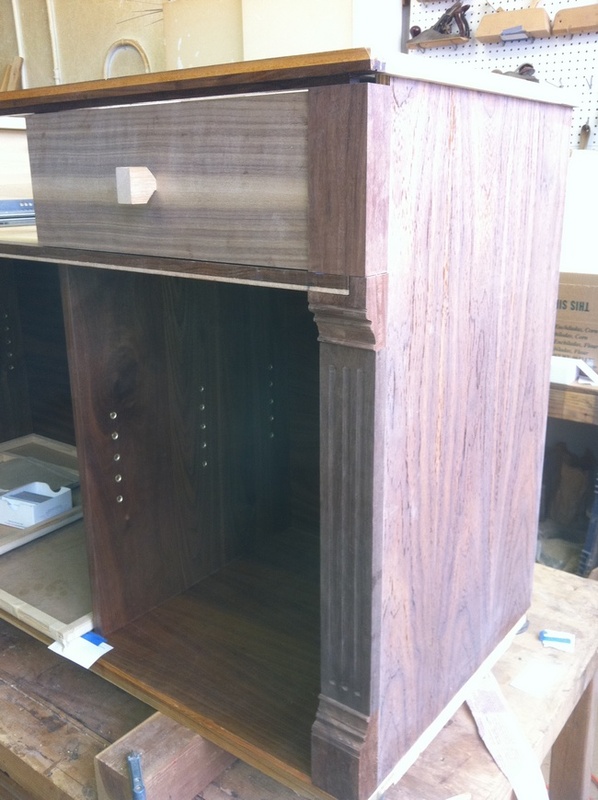 Finished left center drawer / door without hardware. Note that the slight bulging is a camera effect. 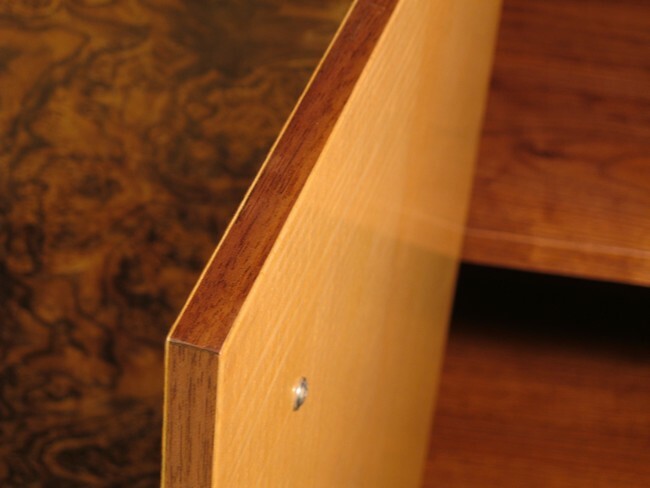 Detail of case. 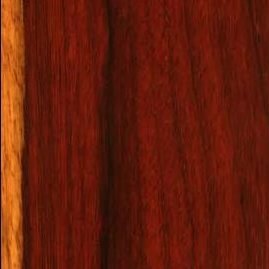 These are the true colors of the top and side veneer. 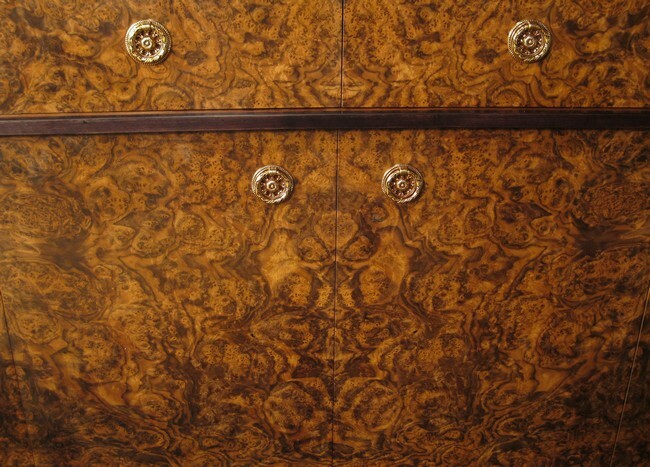 Client selected beautiful European-style pulls. 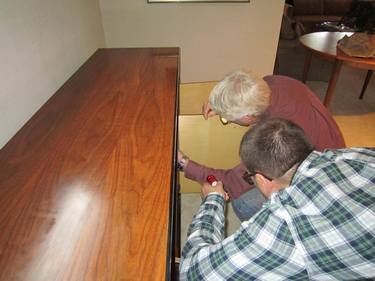 Install on drawers and doors. Also add bullet catches on bottoms of doors. 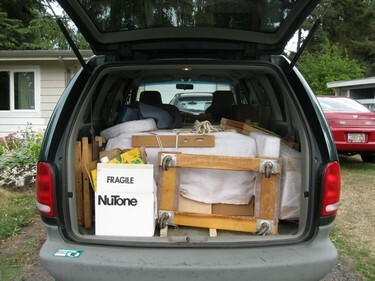 Install drawers and doors and adjust fit. 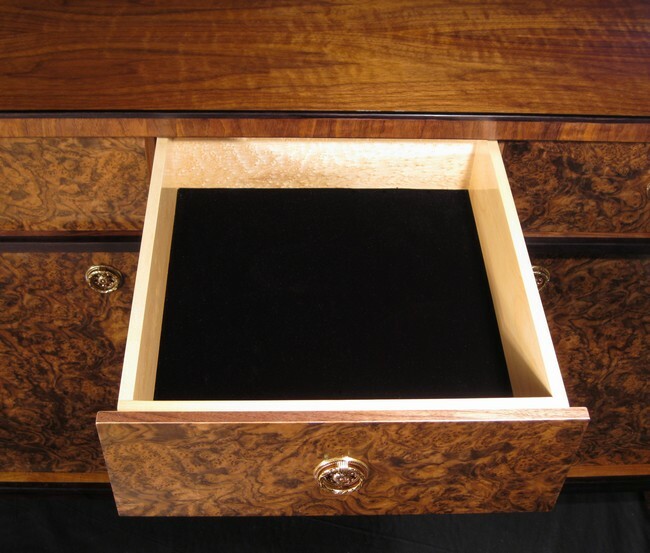 Make and fit velvet linings for drawers. 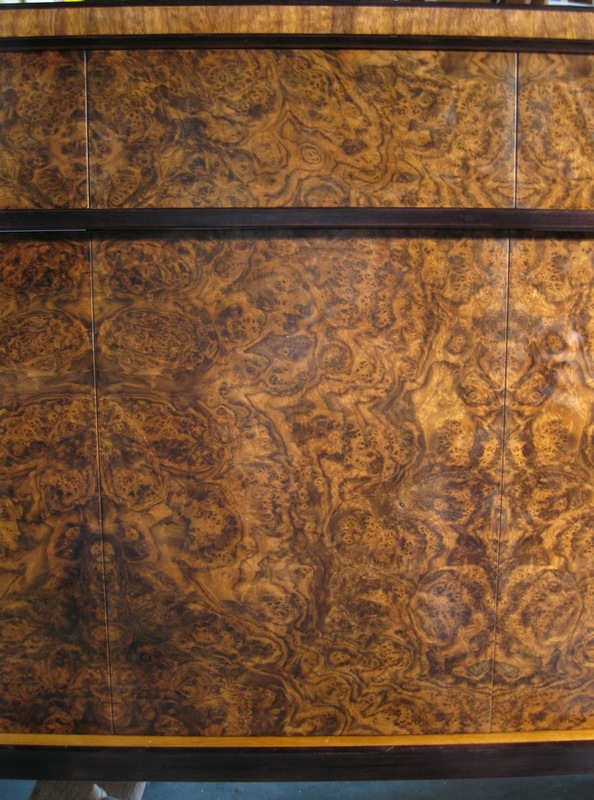 The top veneers exhibit what the French term "chatoyancy." 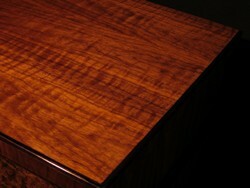 The wood pattern reflects light differently as light source is moved. These three pictures are at same angle to top, just the light has moved across top. I signed the piece on the inside of the door. This also shows the beautiful quarter-sawn ash inside of doors.